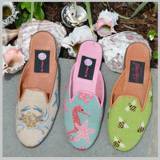 Just Preppy is proud to offer Original Monogrammed Clogs and Sandals from The Pink Monogram. You will love the wool colors and leather selections available, not to mention all of the options for monogramming your custom-made pair! Everyone should have a pair of Palm Beach Sandals, as well. The classic monogrammed sandal is a particular favorite. With so many colors to choose from, you will want a pair for every outfit! Needlepoint loafers, mules and ballet flats are also favorites; and check out the monogrammed boots and rain boots, too.